Congressman Tonko speaks highly of Sr. Simone's determination and resilience when speaking to social and economic justice. He thanks her for engineering and mobilizing the Nuns on the Bus. He describes the bus as fueled on People Power, and it is People Power that will drive us all to victory. He notes that congress left Washington a few days ago for a 7 week recess with a mountain of unfitted business that could address social and economic justice. He brings up income inequality, unfair tax policies, unbalanced voting rights, the broken immigration system, and an underperforming healthcare system. He calls for action now and commends the Nuns on the Bus for their work. He declares the importance of everyone working together and raising their voices in Washington- whether in DC or hundreds of miles away. He calls us to "make good trouble" as congressman John Lewis says. He says that our political process allows for us to make good trouble to make the government work for all. He calls for comfortable housing for all, ensuring everyone's right to vote. 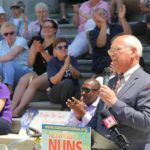 He notes how proud he is to host the Nuns on the Bus in Albany. He calls us to ensure that our values are reflected in our governance. He calls us to empathy, saying that "when one hurts among us, we should all feel the hurt," and that we should use our political system to benefit us all. He looks forward to the day when the Nuns and their people-powered bus will roll into Washington to celebrate the mending of the gaps.